Excerpted and adapted with permission from The Outdoor Life of Children, Volume Two of the Charlotte Mason Topics series. This pleasant earth of ours is not to be overlooked in the out-of-door education of the children. ‘How do you get time for so much?’ ‘Oh, I leave out subjects of no educational value; I do not teach geography, for instance,’ said an advanced young theorist with all sorts of certificates. But the mother, who knows better, will find a hundred opportunities to teach geography by the way: a duck-pond is a lake or an inland sea; any brooklet will serve to illustrate the great rivers of the world; a hillock grows into a mountain––an Alpine system; a hazel-copse suggests the mighty forests of the Amazon; a reedy swamp, the rice-fields of China; a meadow, the boundless prairies of the West; the pretty purple flowers of the common mallow is a text whereon to hang the cotton fields of the Southern States: indeed, the whole field of pictorial geography––maps may wait until by-and-by––may be covered in this way. And not only this: the children should be taught to observe the position of the sun in the heavens from hour to hour, and by his position, to tell the time of day. Of course they will want to known why the sun is such an indefatigable traveler, and thereby hangs a wonderful tale, which they may as well learn in the ‘age of faith,’ of the relative sizes of sun and earth, and of the nature and movements of the latter. “Clouds and rain, snow and hail, winds and vapours, fulfilling His Word”––are all everyday mysteries that the mother will be called upon to explain faithfully, however simply. There are certain ideas which children must get from within a walking radius of their own home if ever they are to have a real understanding of maps and of geographical terms. Distance is one of these, and the first idea of distance is to be attained by what children find a delightful operation. A child walks at his usual pace; somebody measures and tells him the length of his pace, and then he measures the paces of his brothers and sisters. Then such a walk, such a distance, here and there, is solemnly paced, and a little sum follows––so many inches or feet covered by each pace equals so many yards in the whole distance. Various short distances about the child’s home should be measured in this way; and when the idea of covering distance is fully established, the idea of times as a means of measurement should be introduced. The time taken to pace a hundred yards should be noted down. Having found out that it takes two minutes to pace a hundred yards, children will be able for the next step––that if they have walked for thirty minutes, the walk should measure fifteen hundred yards; in thirty-five minutes they would have walked a mile, or rather seventeen hundred and fifty yards, and then they could add the ten yards more which would make a mile. The longer the legs the longer the pace, and most grown people can walk a mile in twenty minutes. By the time they have got somewhat familiar with the idea of distance, that of direction should be introduced. The first step is to make children observant of the progress of the sun. The child who observes the sun for a year and notes down for himself, or dictates, the times of his rising and setting for the greater part of the year, and the points of his rising and setting, will have secured a basis for a good deal of definite knowledge. Such observation should take in the reflection of the sun’s light, the evening light reflected by east windows, the morning light by west windows, the varying length and intensity of shadows, the cause of shadows, to be learned by the shadow cast by a figure between the blind and a candle. He should associate, too, the hot hours of the day with the sun high overhead, and the cool hours of the morning and evening with a low sun; and should be reminded, that if he stands straight before the fire, he feels the heat more than if he were in a corner of the room. When he is prepared by a little observation in the course of the sun, he is ready to take in the idea of direction, which depends entirely upon the sun. Of course the first two ideas are that the sun rises in the east and sets in the west; from this fact he will be able to tell the direction in which the places near his own home, or the streets of his own town, lie. Bid him stand so that his right is towards the east where the sun rises, and his left towards the west where the sun sets. Then he is looking towards the north and his back is towards the south. All the houses, streets and towns on his right hand are to the east of him, those on the left are to the west. The places he must walk straight forward to reach are north of him, and the places behind him are to the south. If he is in a place new to him where he has never seen the sun rise or set and wants to know in what direction a certain road runs, he must notice in what direction his own shadow falls at twelve o’clock, because at noon the shadows of all objects fall towards the north. Then if he face the north, he has, as before, the south behind him, the east on his right hand, the west on his left; or if he face the sun at noon, he faces south. This will throw an interesting light for him on the names of our great railways. A child may become ready in noticing the directions of places by a little practice. Let him notice how each of the windows of his schoolroom faces, or the windows of each of the rooms in his home; the rows of houses he passes in his walks, and which are north, south, east and west sides of the churches he knows. He will soon be prepared to notice the direction of the wind by noticing the smoke from the chimneys, the movement of branches, corn, grass, etc. If the wind blow from the north––’The north wind doth blow and we shall have snow.’ If it blow from the west, a west wind, we expect rain. Care must be taken at this point to make it clear to the child that the wind is named after the quarter it comes from, and not from the point it blows towards––just as he is English because he was born in England, and not French because he goes to France. The ideas of distance and direction may now be combined. Such a building is two hundred yards to the east of a gate, such a village two miles to the west. He will soon come across the difficulty, that a place is not exactly east or west, north or south. It is well to let him give, in a round-about way, the direction of places as––’more to the east than the west, ‘very near the east but not quite,’ ‘half-way between east and west.’ He will value the exact means of expression all the more for having felt the need of them. Later, he should be introduced to the wonders of the mariner’s compass, should have a little pocket compass of his own, and should observe the four cardinal and all other points. These will afford him the names for directions that he has found it difficult to describe. The children having got the idea of direction, it will be quite easy to introduce that of boundaries––such and such a turnip field, for instance, is bounded by the highroad on the south, by a wheat crop on the south-east, a hedge on the north-east, and so on; the children getting by degrees the idea that the boundaries of a given space are simply whatever touches it on every side. Thus one crop may touch another without any dividing line, and therefore one crop bounds the other. It is well that children should get clear notions on this subject, or, later, they will be vague when they learn that such a county is ‘bounded’ by so and so. In connection with bounded spaces whether they be villages, towns, ponds, fields, or what not, children should be led to notice the various crops raised in the district, why pasture-lands and why cornfields, what manner of rocks appear, and how many sorts of tree grow in the neighbourhood. For every field or other space that is examined, that they should draw a rude plan in the sand, giving the shape roughly and lettering the directions as N, S, W, etc. By-and-by, when they have learned to draw plans indoors, they will occasionally pace the length of a field and draw their plan according to scale, allowing an inch for five or for ten yards. The ground-plans of garden, stables, house, etc. might follow. It is probable that a child’s own neighbourhood will give him opportunities to learn the meaning of hill and dale, pool and brook, watershed, the current, bed, banks, tributaries of a brook, the relative positions of villages and towns; and all this local geography he must be able to figure roughly on a plan done with chalk on a rock, or with walking stick in the gravel, perceiving the relative distances and situations of the places he marks. 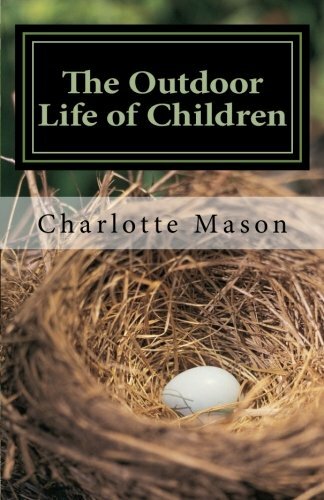 Excerpted from the book, The Outdoor Life of Children, by Charlotte Mason (Volume Two in the Charlotte Mason Topic Series). For ordering information and further details, simply click on the book title or cover.